I received a copy of She Is Mine : A War Orphan's Incredible Journey of Survival back in November but had told the author that I wouldn't be able to read it until January, due to the impending holidays. Holidays being over, I settled down Monday afternoon with this book and did not stand back up again until I had read it all the way through. I offer you this warning that once you begin the story, you will not find yourself able to set it down. Life became consumed with this book. Upon finishing it I handed it to Jonathan with the idea of him being able to read it the same day. He did!!! (It's not hard to do, I'm tellin' you!) We were both blown away by Stephanie Fast's story. Stephanie was not her first name. She can't remember what her mother called her. There was too much trauma involved between the life she lived with her mother (prior to age 4) and the time she spent alone, abandoned. Born in South Korea, Stephanie was of mixed blood. Her father was an American serviceman who never knew of her existence. Her mother's family wanted nothing to do with an illegitimate child who was also of mixed blood. Stephanie remembers bits and pieces from her childhood in Korea. She remembers overhearing the argument in which her mother was told by her family that she must rid herself of her daughter. She remembers being placed on a train and left to fend for herself. She remembers her journey in trying to find her mother again and all of the painful circumstances involved in the process. She recounts many horrifying stories from her childhood (which can hardly be called a "childhood") in which she simply worked hard to merely survive. Alone in the world, rejected by her family and her society she was eventually adopted into a family from the United States. This is a fact she is grateful for. I don't want to spent much more time describing her story to you because it would take away from the effect of you reading her story for yourself. It is a powerful tale and deeply moving. Fast is now a grandmother and spends her time writing and speaking to others about the plight of the orphan. This book is dedicated to the estimated 143,000,000 orphans living in this world today. She is quick to say that although her story might be unique, it is also a general tale of woe which orphans from around the globe can identify with in some form or fashion. She and her husband now work tirelessly to make others aware of the need to care for orphans. "It has taken many, many years of healing, but now I know the truth of who I am. I walk with patience, doing my part to improve orphan care. Embracing life day by day, I live with the belief that great things lie ahead. Let me note, for reference sake, that Mrs. Fast is a Christian. Her life is defined by Christ and she makes a point of saying so. Her life could not be considered "easy" by anyone who has heard her story but her story is filled with hope for the future. I think that is most of what makes her story so compelling. You get a very clear picture in the reading of this book of what her life is like. The story will fill you with horror and dread. But on each page is the heartbeat of hope. She wishes to share that hope with others who are lonely, abandoned, and abused. After reading her story, I was left with nothing but deep respect and also excitement for the message. Now, the first reason I was drawn to this book is, of course, because our family has adopted from South Korea twice. We therefore talk a lot about adoption in our household. We speak of it as being God's good plan for all of our lives. I am not some sad victim to be pitied because my children weren't born to me biologically and my children are not victims to be pitied because they are part of a family. We are a family, same is as if we all looked like one another. Before we adopted people who had already done so would tell me that there would come a point that I would forget these children were adopted. I confess that I questioned sometimes how this could be so. Wouldn't their faces remind me? What about their temperaments? Their personalities? Wouldn't everything suggest in some form or fashion that we weren't blood related? Ultimately, we made a conscious choice to believe that this was the right thing to do and to step out in faith, even despite some fierce winds of opposition. And you know what? Everything I was told was true! You do forget that you have "adopted children". They become a part of you and you of them, even though they might be slightly different. Family is born and we all belong to each other, wholly and completely. It is a mystery and it is a beautiful thing. Is adoption an easy thing to do? No. Is it a natural thing to do? I would argue, from the perspective of Christianity, that it is. It seems to go against nature but in all actuality, it doesn't. People who are uniquely different are placed together and learn to belong and take on one another's traits. You become family, much like we Christians have become a part of God's family. He is wholly other than us, holy and set-apart. And yet He has adopted us and made us part of His family with all rights and privileges thereof. We belong. We are loved. Is this to say that sorrow and sadness are not woven in and out of the process? I would be lying if I suggested that was not the case. There have been occasional tears, both on our part and that of our children. We talk a lot about their birth mothers. We wonder where they are, what they are like, what their lives are like, and if we will ever meet them. (We will try to meet them someday.) But at the end of these questions we always bring ourselves back to the position that God works all things together for our good and for His glory and this answer satisfies exactly as it should. That is perhaps why I feel so strongly about sharing Stephanie Fast's story with you. It is the story of pain and anguish, yes, but concludes with glorious joy. Does she still struggle from time to time with her past? Undeniably. However, she submits her pain to the Lord and that is what I hope to teach and encourage my children to do also. It is what I do for myself. It is what we Christians ought to do. He is sovereign and in His goodness, He matched people from different continents and societies and put them together to belong, to be loved, and to bring glory to His name. Remember how I said that I used to wonder what I would think of my children when I looked into their very different faces and wonder how this whole adoption thing would work? I do stop sometimes just to look at my kids but I am not asking myself questions about whether or not a good choice was made. I am convinced all is as it should be and it is good. Rather, most often when I look at my kids I think to myself, "I see the Gospel message in their faces." Just the way that we each look as a family sends a message to others. The world would say to us sometimes, "You do not belong to each other." I would answer with a hearty, "Yes, hallelujah! We DO!" It is true that we encounter people and arguments (both inside and outside of the church) that says one ought to hesitate greatly over the matter of adoption if it is to be pursued at all. Is there corruption in the process in places? Certainly. But just because some foods have been genetically altered doesn't mean that I should stop eating. Do your homework on organizations and agencies and keep your eyes and ears open but do not ignore our call to look after orphans in their distress (James 1:27) just because it makes you uncomfortable. Lots of good things will make you uncomfortable. Lots of good things require hard work to bring about. There is glory even in this hard work. I do feel quite strongly and passionately about Fast's story in part because it is encouragement to my soul. When I hear Christians, in particular, question adoption (international has the most suspicion attached to it) it makes my heart ache. Adoption is a glorious thing! It is a hard thing and perhaps an uncomfortable one, but a glorious thing! I cannot look to the world to find out what God has called me to. I must look to Him and to His Word and I so appreciate that Fast is here to encourage the downhearted and downtrodden - adopter and adoptee alike! She is being faithful to tell her story of hope, redemption and peace. She is enthusiastic about making a difference in this world and it is hard not to feel her enthusiasm. Indeed it is hard not to marvel at it, considering her experiences. I so admire people who have gone through hard times and stand up shouting that the Lord, He is good! Blessed indeed are the men and women who trust in Him. If all I can do to be a part of this "orphan awareness" campaign is write this blog post, then I must write it. But I will also live it within the four walls of my own home and would love to encourage you to consider how you might also live it. Perhaps you are not called to bring an orphan into your home (although it begs the question, "Why not?") but simply to support (with prayer or finances) a well researched organization, agency or family as they do this beautiful, hard thing. If you have made it to the end of this post then I must thank you for your time. Next I would encourage you to pick up this book, read it for yourself and see what you think. I am delighted to say that I have FIVE copies of She Is Mine to five of you. This contest is opened to U.S. Residents only and will run through Wednesday, January 21st. Please, please, please!!! Leave a valid e-mail address along with your comment entry. I will ship your books out shortly! Thank you for caring to read this book! I can't wait to hear what you think! I also want you to know that I care so much about this message that I arranged to purchase these giveaway copies from the author. I'm putting my money where my mouth is on this one. I love her story and I want you to read it. 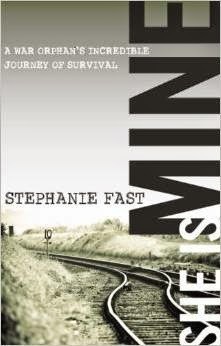 You can find out more about Stephanie Fast and her ministry on her website. Many thanks to author Stephanie Fast who sent me a copy of this book in order to facilitate this review. I have received no additional compensation and all opinions are 100% my very own. This sounds like a captivating read. I would love to win a copy. barbarah06(at)gmail(dot)com. I'll buy a copy if I don't win it here! Sign me up! Putting this on my to read list regardless of if I win it or not. It sounds fascinating. sounds like a really good read! This book sounds great. Thanks for the chance to win a copy. Wow. I saw you mention this on FB and wanted to come enter...but it was only now that I had the time to read the review. I appreciate your passion for the book and your honesty about adoption. To buy the books from the author. Wow. This sounds like an incredibly powerful book, I would LOVE to win, read and share this! I would LOVE to get my hands on a copy of this book!!! I am saving your blog post to read after I get to read the book. I am just so thankful that you are spreading the word high and wide because it sounds amazing! !